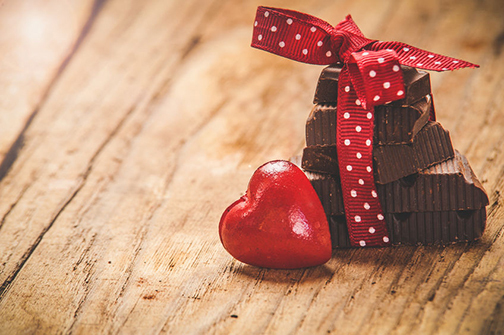 Celebrate Valentine's Day this week with chocolate. Chocolate, also called the food of the gods, has a long history. It was first discovered by the Aztecs hundreds of years ago and called xocolatl, meaning bitter water. At that time, the cocoa bean was pounded then mixed with spices and water to be consumed as a beverage. The Aztec king Montezuma was said to have consumed 50 golden goblets of the chocolate beverage daily believing it was an aphrodisiac. From Mexico, chocolate was taken to Spain where it became popular first in the Spanish court later spreading to the rest of Europe. Since then it has gained huge popularity in the dessert world – cakes, cookies, ice-cream, chocolates and only occasionally as a savoury such as the Mexican moles. Chocolate’s energy producing power has made it a go to food for those requiring pep; however, chocolate’s alluring flavour has captivated the hearts and taste buds of the world. The following recipe is a fine example of the addictive qualities of chocolate. Although a sophisticated dessert, it is soooo simple to make! Serve this rich dessert – actually a gigantic truffle, in thin slivers with a dollop of Chantilly cream (sweetened whipped cream) and a spoonful of fresh raspberries. Dessert Heaven! Cooking Tips: Major grocery stores are a source for imported, quality bittersweet chocolate ideal for recipes. Look for amaretti (almond cookies) in Italian stores such as Vinzeno’s on Danforth at Westlake. In a medium mixing bowl set over a saucepan of simmering water, not boiling, add chopped chocolate and butter to melt. Stir mixture frequently and once melted remove immediately from heat to cool to room temperature. Stir in Amaretto or other liquor of choice. In a deep bowl using an electric mixer, beat whipping cream until soft peaks form. Gradually, spoonful by spoonful add icing sugar and beat in to form stiff peaks. Stir in liquor and fold the whipped cream into cooled chocolate. Line a 9- inch (23 cm) spring form pan with parchment paper. Sprinkle the prepared pan with the amaretti crumbs. If unavailable, toast almonds 10 minutes at 350 F (180C); chop finely and sprinkle over bottom of pan. Spoon chocolate mixture over crumb layer and smooth evenly. Cover and refrigerate until ready to serve. Dessert freezes well for up to 1 month if well wrapped in foil. To Serve: Run a knife dipped into hot water around outer edge of pan to loosen and remove sides of spring form pan. Slide torte, crumb side down, onto cake platter. If you wish pipe Chantilly cream in rosettes around base of cake or simply slice cake with hot knife and serve on dessert plates with a spoonful of Chantilly cream and raspberries.